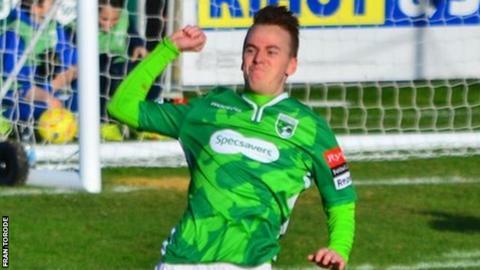 Guernsey FC manager Tony Vance has backed attacker Marc McGrath despite scoring just once so far this campaign. The 29-year-old was the Green Lions' top scorer last season with 23 goals and won several club awards. "OK, he's only scored one goal, but his role is slightly different in a 4-5-1 formation," Vance told BBC Guernsey. "Marc is without a doubt one of the best team players we've got. His movement's outstanding and he creates opportunities and space for people." McGrath played the lead striker role last season, a role which Ross Allen has returned to in the Isthmian League Division One South. Meanwhile, Vance has several injury concerns including midfielder Josh Steel, who has a hamstring problem, and Jason Winch, who has suffered knee ligament damage in the past. "He's felt something in there and we're hopeful it hasn't happened again because he's had some cruel luck," added Vance. "I was really gutted for him to be honest and hope it's not what everyone fears. At the moment the signs are promising." Klopp & Liverpool - a perfect fit? Read more on Jurgen Klopp: Have Liverpool found their perfect match?